The data centers of today are mostly cloud based with virtualized servers to provide on-demand scalability and flexibility of the available resources such as CPU, memory, data storage and network bandwidth. A cloud data center provider may offer resources as IaaS, PaaS and SaaS. In this respect, it is necessary to maintain a proper mapping of the virtual resources to the underlying physical hardware. This is a particularly difficult task, considering the cloud resource heterogeneity, the unpredictable nature of workload, and the diversified objectives of cloud users. Finally, it is desirable to always select the most appropriate resource type depending on the user requests. FPGAs increase the popularity of hardware accelerators which can provide better performance and less energy consumption depending on the problem properties and size. To this end, the very recent research focuses on employing hardware resources in cloud based data centers. Integrating hardware resources in the cloud based data center should be seamless, together with virtualization and dynamic resource allocation capabilities. This project proposes a novel architecture for cloud-based data centers that we call ACCLOUD (ACcelerated CLOUD). The proposed architecture features FPGA hardware resources that can be offered to users in the scope of IaaS, PaaS and SaaS. To this end, we propose augmenting the cloud servers with FPGA as well as to employ standalone FPGA units. The FPGA resources are virtualized using a number of run-time partially reconfigurable regions. We propose to use the OpenStack software framework to allocate these partially reconfigurable regions to the users together with other virtualized computing resources. To this end, the first major contribution of this project is offering hardware resources as IaaS, PaaS and SaaS in the ACCLOUD architecture different from all previous work. The second major contribution is the entirely novel resource management approach ACCLOUD-MAN that incorporates the hardware resources into the existing CPU, memory, bandwidth and disk resources and coordinates the IaaS, PaaS and SaaS management. To this end, ACCLOUD-MAN achieves near globally optimum resource allocation together with increased performance by employing hardware resources for SaaS whenever appropriate. 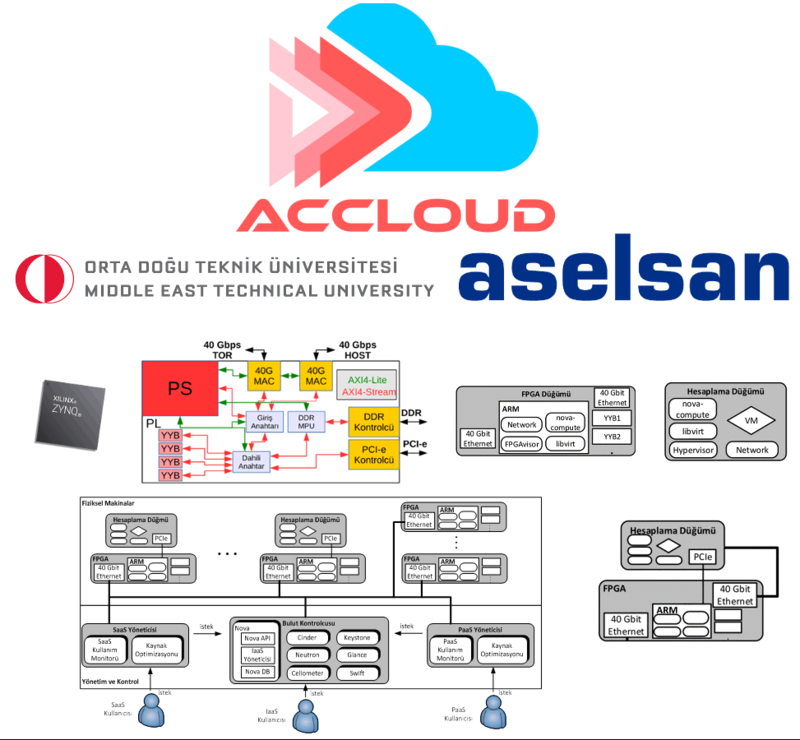 The third major contribution of the project is the extensive optimization evaluation, simulation and real test bed implementation and evaluation of ACCLOUD and ACCLOUD-MAN. The project is proposed in the form of one main project (METU) with one sub-project (ASELSAN) together with competent project teams. The METU project team has experience in research and development of high speed hardware architectures for computer networking and network processing. The ASELSAN project team has experience in the development and implementation of advanced FPGA-based architectures.